Map of Belgium and The Netherlands. 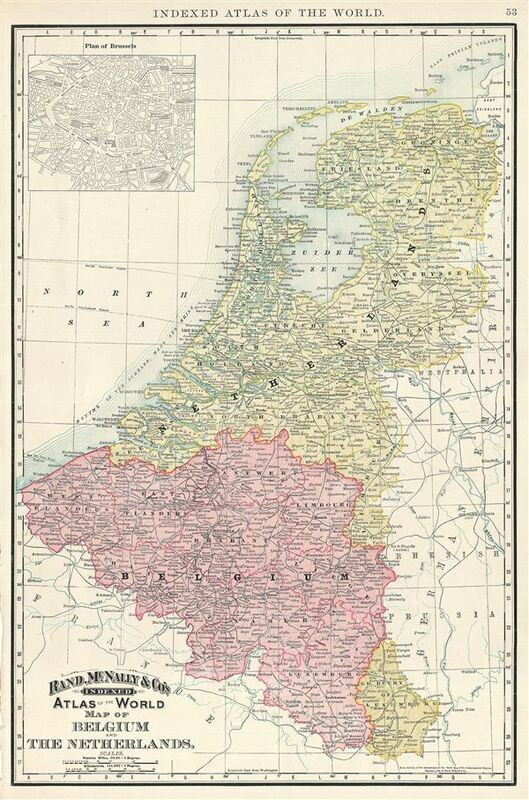 This is a beautiful example of Rand McNally and Company's 1891 map of Belgium and the Netherlands. The map covers both Holland and Belgium from Friesland to Luxembourg and includes the Grand Duchy of Luxemburg. An inset in the upper left quadrant details the Plan of Brussels. In 1830, the Belgian Revolution led to the secession of Belgium from the United Kingdom of Netherlands and it's subsequently consolidation as the independent Kingdom of Belgium. Though Belgium had successfully attained self-rule, the Netherlands refused to recognize the new country until the 1839 Treaty of London. The Grand Duchy of Luxemburg continued to be part of the Netherlands until 1890 when the Grand Duke of Luxemburg and King of the Netherlands, William III, died with no male heirs. The Dutch throne passed on to his daughter, but Nassau Family Pact, restricted Luxembourg to a male heir so the throne passed to House of Nassau-Weilburg. Color coded according to territories, the map notes several towns, cities, rivers and various other topographical details with relief shown by hachure. This map was issued as plate no. 53 in the 1895 issue of Rand McNally and Company's Indexed Atlas of the World - possibly the finest atlas Rand McNally ever issued. Rumsey 3565.012 (1897 edition). Philip (atlases) 1026 (1898 edition).